I like to whenever possible do things simply. When it comes to baking, especially in the summer it’s great to have a dessert on hand that you don’t have to bake and heat up the house. This one fits all the above criteria. 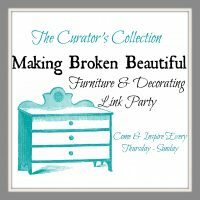 It doesn’t take long to put it together and it takes even less time to make it disappear. For chocolate and peanut butter lovers it’s an answer to a prayer. 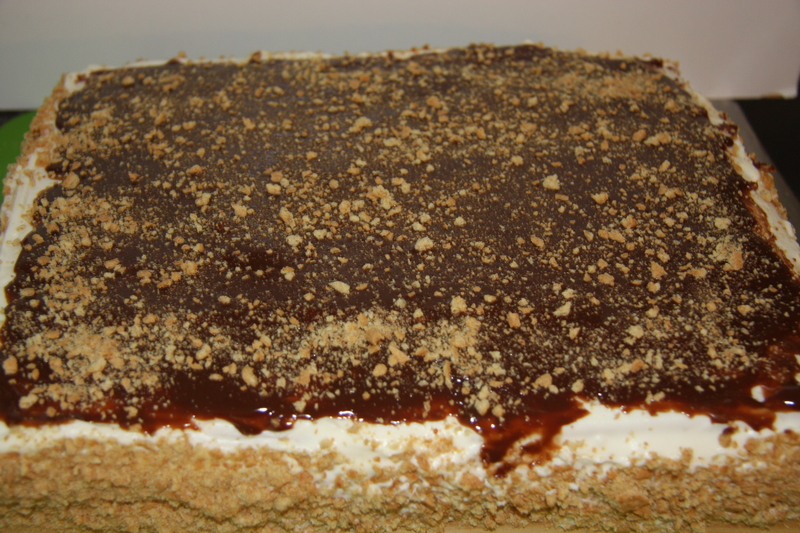 How can you not love less work, chocolate, peanut butter, cream cheese and oh, did I forget to mention, whip cream. Whisk 2 cups of 35% whipping cream together until it forms stiff peaks. Set aside. 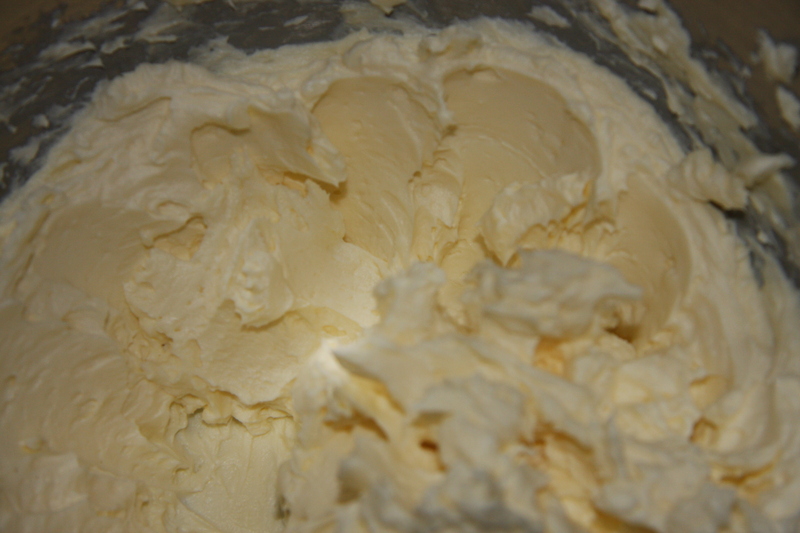 Next whip 1/2 cup of butter until nice and light, then add one 8 oz. package of cream cheese. Beat this mixture with a whisk of a mix master, if possible, until there are no lumps of cream cheese left and everything is smooth. Next add 1 can of sweetened condensed milk. Whisk again until all is well blended. 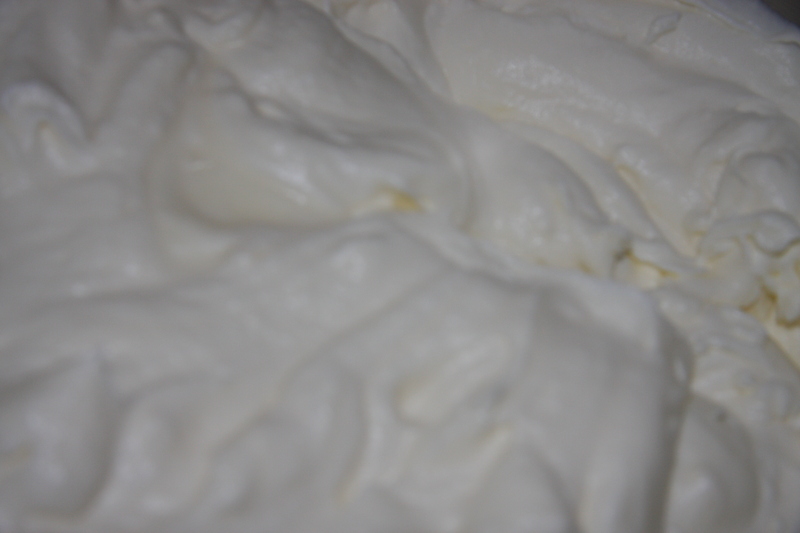 Then by hand into a large bowl combine the cream cheese mixture and the whip cream, gently folding in the whipping cream so as not to deflate very much. Set aside. 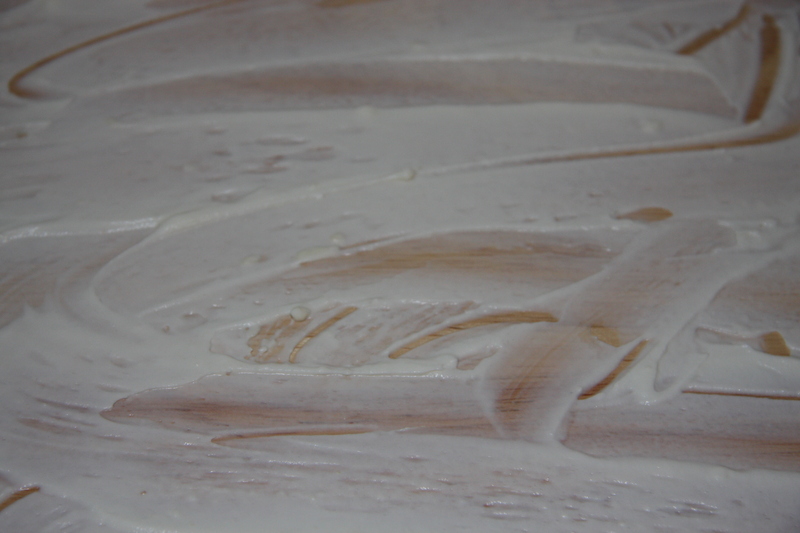 Onto a flat surface, I used a cutting board 9×11, coat the surface with some of the whip cream mixture. This is to prevent the graham crackers from sliding. Set aside 1 to 1-1/2 cups of this whip cream mixture to coat the top and sides of the cake, along with 5 of the crushed graham crackers. 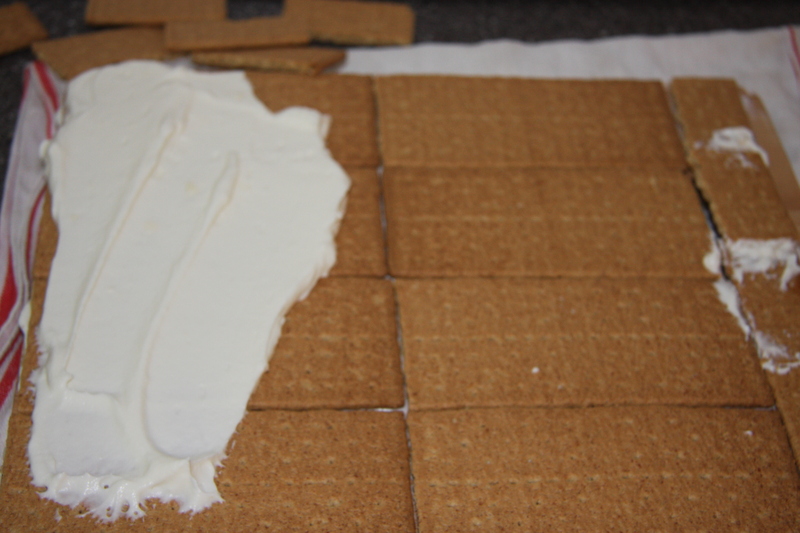 Place 1 layer of graham crackers over the surface you are using, followed by a layer of whip cream filling. Repeat this process until 2 boxes of the graham crackers and the whip cream mixture is used. 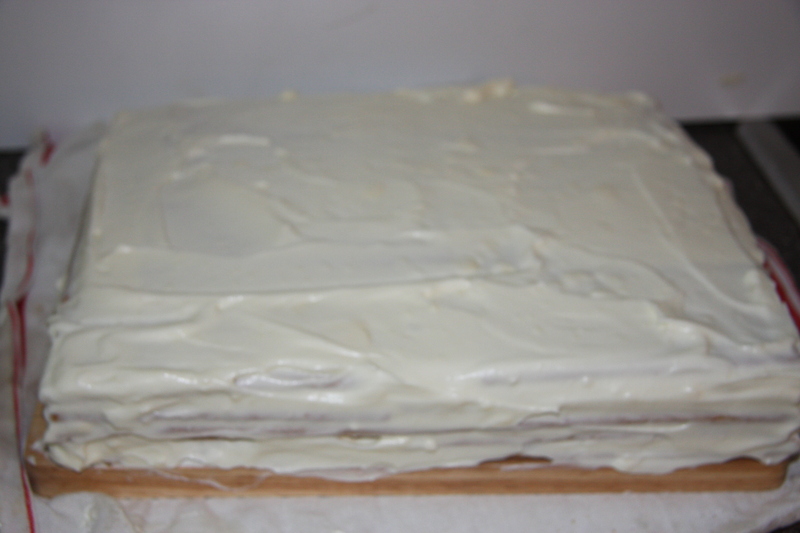 Once the cake is assembled cover the top and sides of the cake with the remaining whip cream mixture. With about 5 of the graham crackers, place them into a bag and crush Here’s a little tip. After Easter when all the chocolate is reduced by 50%-75%, buy enough for your baking to last you for the coming year. Just put it in the freezer and it will last forever. Melt 3/4 cup of chocolate and 3/4 cup of butter. When melted stir together until well blended. I start placing the melted chocolate on the cake by painting it on with a brush. When you have a layer covering the cake, start slowly and pour a small amount on the cake and spread it evenly, making sure not to go over the edges. Then I cut about 2 cups of mini peanut butter cups in half and place them all around the top edge of the cake. Then sprinkle some of the crushed graham crumbs on top of the chocolate. Store the cake in the fridge until you are ready to use it. I usually take it out 1 -2 hours before I serve it. All done and ready to eat. RECIPE INGREDIENTS CAKE 2 Boxes Graham Crackers 1 – 8 Ounce Package Cream Cheese, Room Temperature 2 Cups 35% Whipping Cream 1/2 Cup Butter, Room Temperature 1 Can Sweetened Condensed Milk 2 Cups Mini Peanut Butter Cups, Cut In Half ICING 3/4 Cup Chopped Milk Chocolate 3/4 Cup Butter 5 Crushed Graham Crumbs PREPARATION Whip the 35% cream until stiff peaks form. Set aside. Crush 5 graham crackers, finely. Set aside. Cut the mini peanut butter cups in half and set aside. 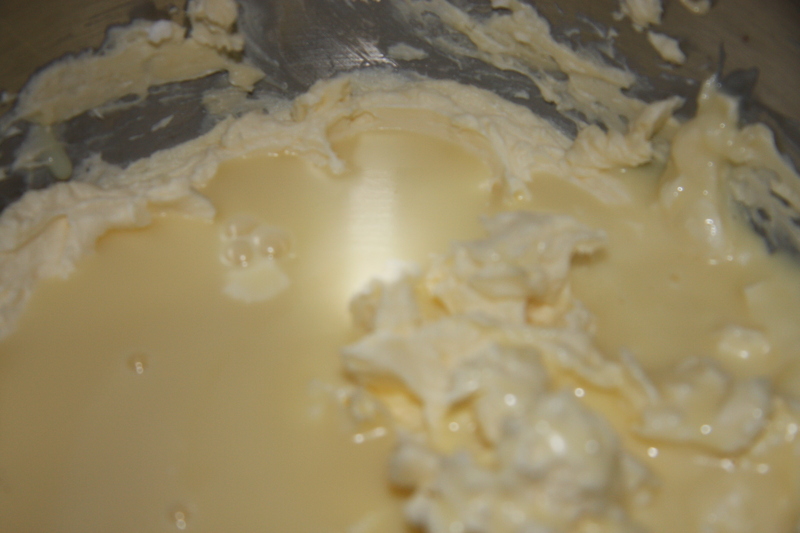 Cream the butter, add cream cheese and whip until well blended and no lumps. Then add sweetened condensed milk and combine until well blended. By hand, add the whipped cream a little at a time until it is all well incorporated. Cover the plate or flat surface for your cake with a thin layer of the whip cream and cream cheese mixture. 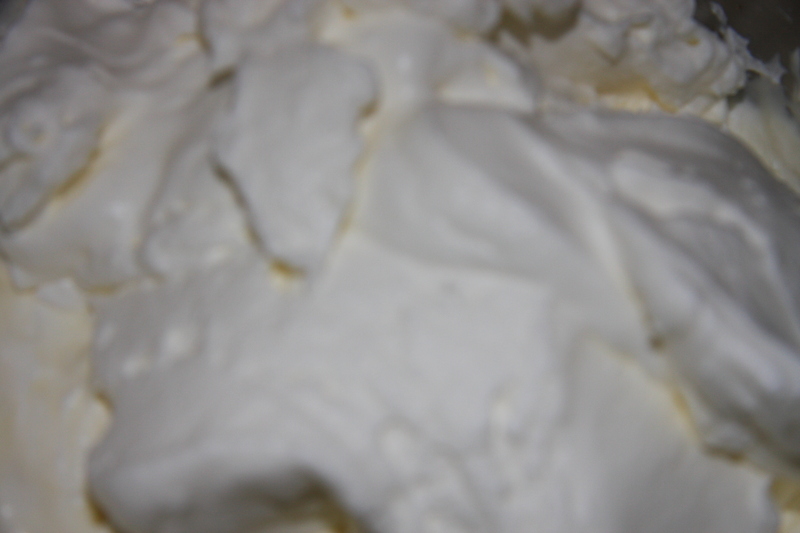 Start by covering the whole surface with the a layer of crackers then the whip cream and cream cheese mixture. 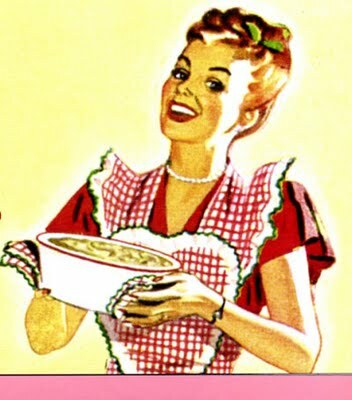 Repeat until all of the crackers and whip cream mixture is used. Reserving about 1 cup to ice the top and sides. 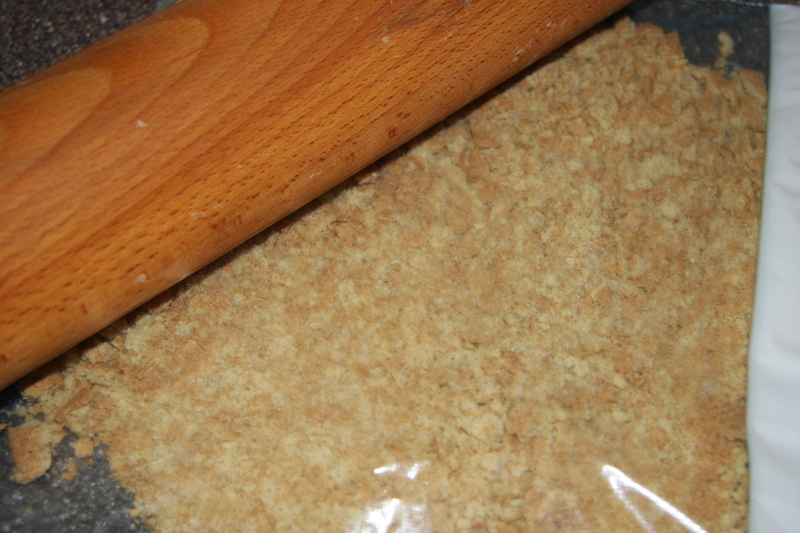 When top and sides are iced place the crushed graham crumbs all around the sides. 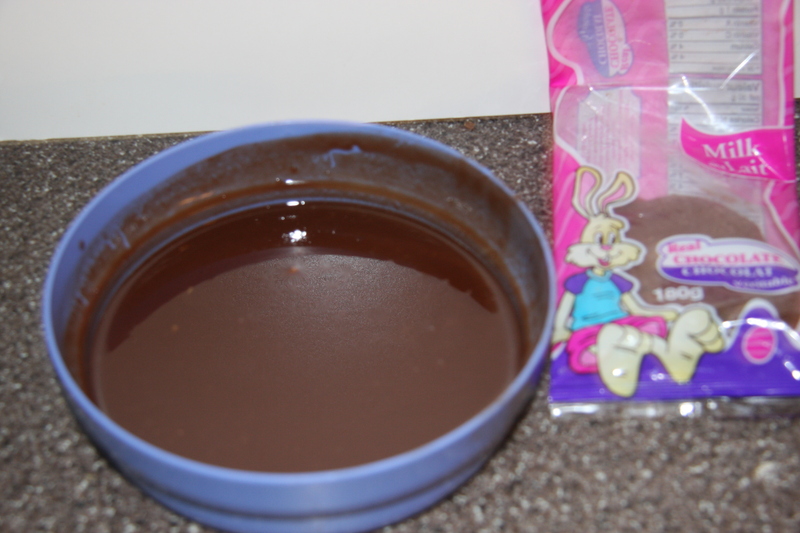 Paint a layer of melted chocolate mixture on the top, followed by another until most of the chocolate is used. Sprinkle some of the crushed graham crumbs on top of the chocolate. 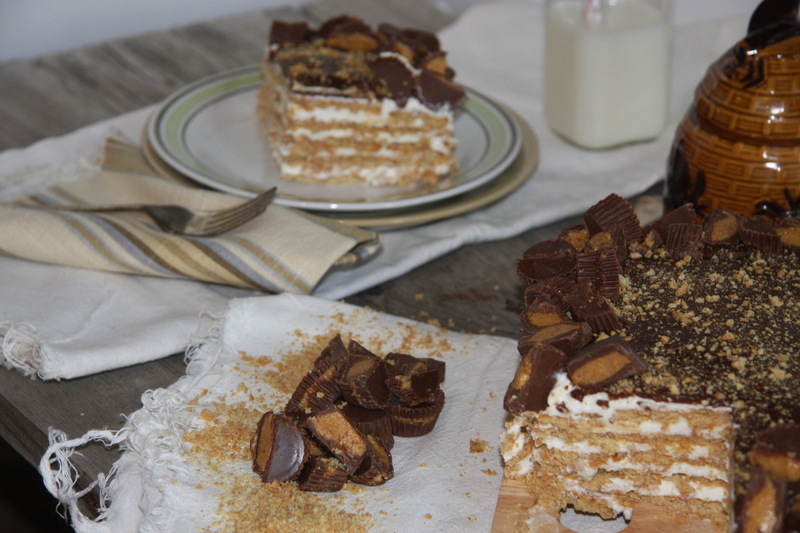 Place the mini peanut butter cups along the top edge to decorate the cake. To store the cake, place it in the fridge. I like to leave the cake at room temperature for 1 hour before serving so it is easy to cut through the chocolate layer on top. Next, cut, serve and ENJOY! Adapted from Let the Baking Begin!